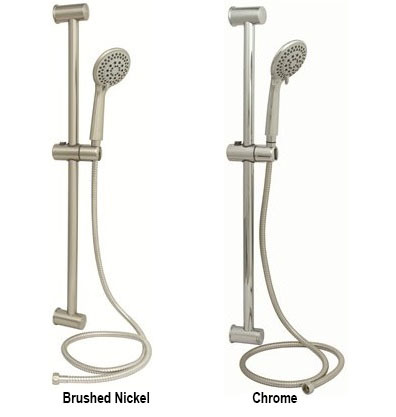 Stainless steel grab bars in satin finish and bright stainless knurled finish. With cover. 1-1/4" OD, Stainless steel tubing with white vinyl powder coating. 1-1/2" wall clearance. Non- institutional look. Exposed screw mount. Corrosion-resistant. Clamp pads protect tub from scratching. Grips at two heights, 15" and 7". Fits tub walls 3.75" to 5.25" wide. Complies with Americans with Disabilities Act (ADA) specifications. Raises seat 5" above toilet bowl. White. Slides onto toilet bowl securely, without tools. Portable, lightweight and easy to clean. Fits most toilets. Weight limit 250 lbs. Contoured polyethylene seat for added comfort. This Premier sliding bar shower set is easy to install and provides an affordable way to upgrade your bathroom décor and enrich your daily shower. This system features a 5 setting handheld showerhead with self cleaning nozzles and a flow rate of 2.0 gallons per minute, round tube with slider, 60 inch hose, and top and bottom mounting brackets. Start your morning with the spa-like functionality. Enjoy fine sprays to pulsating massage streams with Premier’ multi-setting showerheads.